Let's talk gifting. It's one of those times of year where you either sink or swim. I know some people who loathe shopping for others and finding it horrific, and I don't blame them because I am one of those people who can't hide their opinion of a gift. I personally love gifting. I get such a high off the shopping, wrapping and giving process that I wanted to share everything I have been tagging as gifts for people. I am pretty much done with my shopping, but I keep adding on little goodies here and there because there are just so many great things popping up on my radar! An adorable planner is basically a guaranteed win for any gal in your life who is organized. A cute catchall also would make that one smile and is a great, versatile piece. I want to give this sweet ornament to so many people because seeing that on the tree would bring a smile to anyone's face! A fun hair tie can glam up any look, while a bright pouf clip does the same for any bag. A makeup set that works for pretty much anyone is a guaranteed win, as is this perfume set that I got for Christmas from my mom last year, and LOVED! A simple necklace, unique piece, fun bracelet or a pretty box to store them in is a guaranteed accessory win. I am fascinated by this book and totally enthralled with this bag, too! How is chic is this phone case? Case App sent me one and it is amazing! It's got an inner protective layer, which, if you know me well, you know I NEED (RIP all of my phone screens. Monthly.) They also let you design your own case or customize their own patterns, which I did with my initials and changing some of the pattern's spacing. Shop cases here. Get 20% off all orders (through 12/14) with code: PINKFABULOUS20. I love the planner! It's so cute and I definitely know a bunch of friends who would love a gift centered around organization! Love all of these, lady! I'll take one of each, please and thank you! Love these! I got the black and white stripe KS planner for nex year and I love it! I'm loving that marble iphone case! These are all really great picks! Thanks so much for sharing! 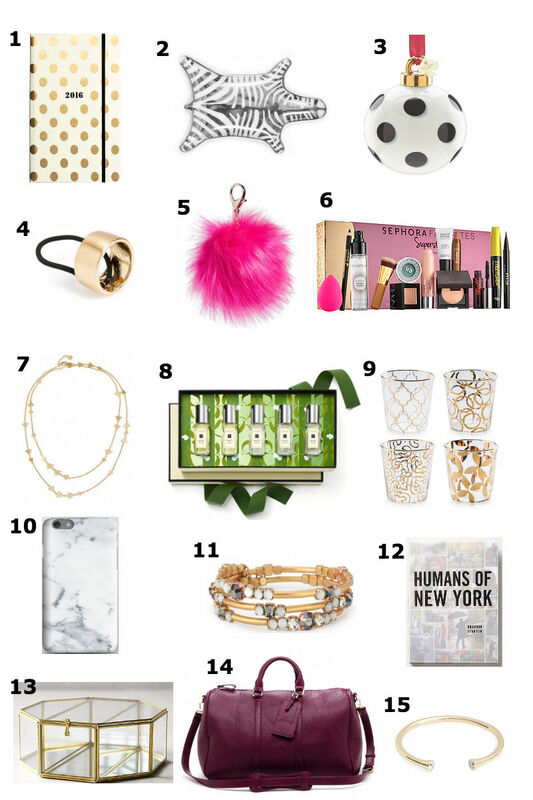 Umm I want seriously everything on your list! No seriously. All of it. That phone case is so fun and I've wanted that jewelry dish forever, I think I just need to get it! I love that Stella and Dot wrap bracelet and it's such a good price point! I'll take one of each, please! I seriously love Christmas shopping, too - my family on the other hand can be such grinches and just do cash now!